So once again I was gone and I had baking with drawl. I was off to California for a week for work, where the best part was that I got to catch up with an old high school friend. Well and we went whale watching and for once we actually saw a whale! It really is beautiful out there and one of my very favorite places to go running. Well then I came home and back to work it was...well work in the office that is. I thought cookies were definitely in order to take my break from work this week and to celebrate spring. Sometimes you need to wake up to a special treat. Something other than pancakes or french toast...something a bit more healthy. Just a little Sunday morning treat. This caramelized banana bread oatmeal is packed with walnuts, flax seeds, raisins, a touch of brown sugar and cinnamon, with caramelized bananas to finish the oatmeal off. It is a great way to start off the day with the right amount of goodness. Well, really I just wanted another excuse to use my kitchen torch...and this seemed like just as good a time as any because I had everything in the kitchen I needed. 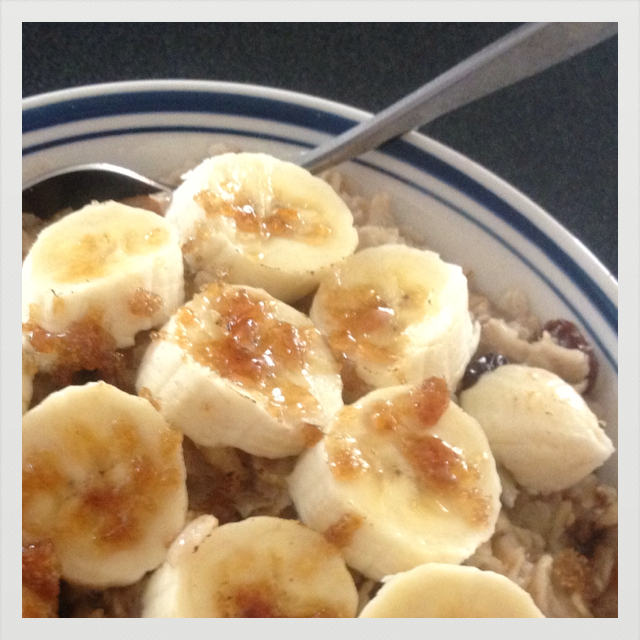 The bananas caramelized just enhances their flavor, adding another depth of flavor to the oatmeal. This comes out delicious, is fairly quick, and is a filling, and healthy breakfast. Try it when you need a little fun and want to change things up a bit. Enjoy! This was the start of my week after a great weekend. Literally the start...I did it again....I got up and made 3 dozen cupcakes before 7am. Sometimes you just got to do what you go to do. Well Kathryn came into town this past weekend and we made some awesome mustachio pistachio shortbread. Well that and we went and had some alligator fritters and delicious beignet pancakes Saturday. Yes, you read that right AND they were served with chocolate sauce, the pancakes that is. But hey went for a run and then ate healthy for dinner, making up some delicious kale pesto (recipe from Shutterbean) served over pasta and roasted vegetables. Then we went out had a few drinks and took in the great view from the top of the W at POV. It was a great weekend; a perfect weekend when I knew this week would be crazy. I've been gone. By gone I mean in Arizona for 10 days for work. Please note this is not me complaining. I had fun, we got 5 meetings done (leaving 13 to go for the season), the food was good, the company was good, AND my "office" was outside overlooking a fountain pool in the warmth of Arizona. Plus I totally had fun playing with my iPhone all week and taking pictures. 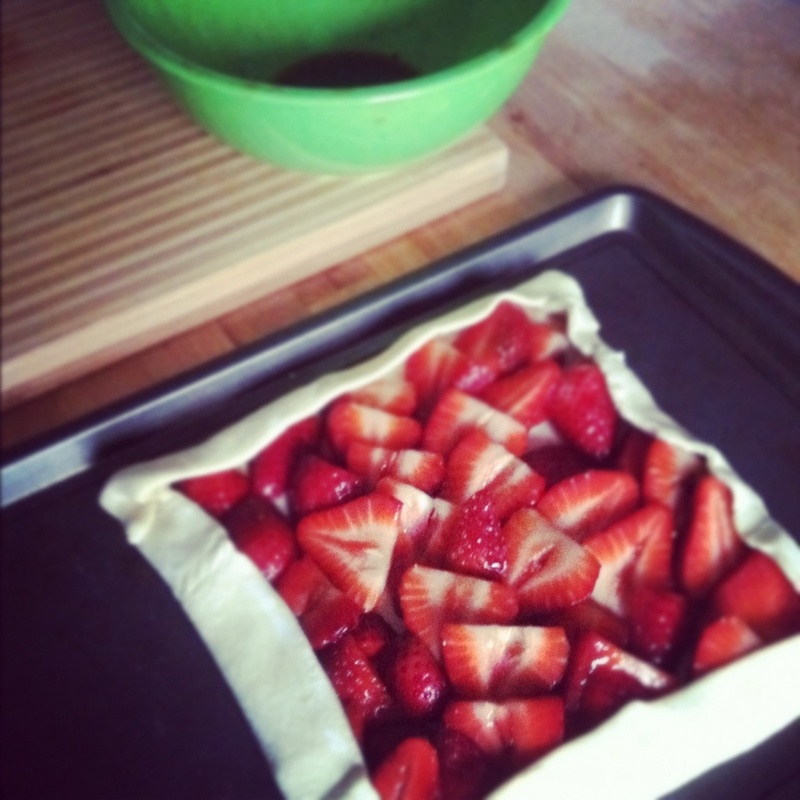 I have missed baking though!